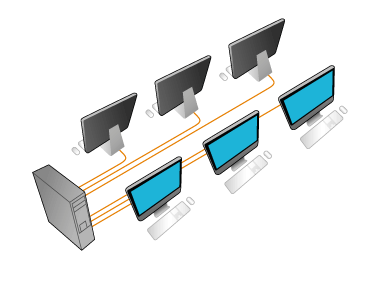 Multiterminal or multiseat computer is a particular configuration that allows a computer to be used by several people simultaneously. If you are interested in getting a multi-monitor program for educational, office or personal needs, we’re the perfect place to find a multiseat computer software solution. Get to know more about shared PC access software ASTER for any virtual desktop management system and multiterminal needs. ASTER is a multiterminal PC program that can turn one computer into several completely independent workstations. Only some extra monitors, keyboards and mouses are required for organizing an effective full-featured multiseat system based on one server. In such a way our multi-monitor solution allows you to achieve big savings on hardware expenses and maintenance while giving almost the same functionality as separate computers. Actually, our multi-monitor application works with usual hardware and is totally transparent for your students, employees, etc. working with standard operating systems. A multiterminal PC program ASTER ensures stable operation with a standard set of office, accounting and training software, graphic applications and even net games. Besides, with virtual desktop manager software from IBIK company there is no need to install a local network between stations for a multiseat system. Moreover, our multiterminal (multiseat) computer software ASTER comes with great cost savings. You can save money on software licenses purchase, energy consumption, additional hardware, etc. With virtual desktop solution from IBIK you will be able to create more workplaces while spending less time on administrating IT infrastructure.